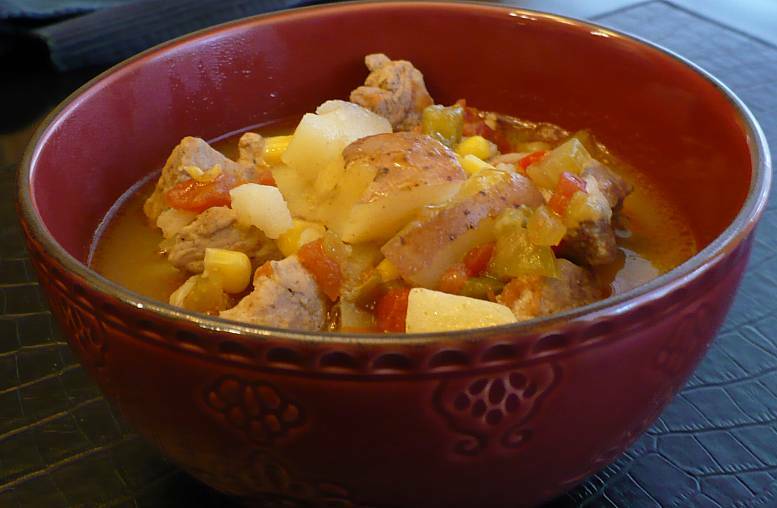 Green chilies and pork combined with lots of colorful veggies make a great soup for day #9 of Soup Month. This soup can easily be thickened at the end if you would like the consistency a little thicker. Serve with warm tortillas or crunchy garlic breadsticks for a yummy dinner. In a large soup pot, over medium-high heat, brown the pieces of pork in oil. When the meat is seared on the outside, but not completely cooked thru, add the corn, celery, onion, peppers and potatoes and stir. Continue to saute the mixture for 5 minutes. Add the cumin, garlic powder, pepper, chipotle powder and salt, stir to combine, then add the chicken broth. Bring soup to a boil then reduce heat to a simmer. Continue to simmer the soup for 45 minutes, until meat and potatoes are tender. ** Note: For a thicker consistency, combine 1/2 cup chicken broth or water with 3 TB flour in a small cup. Stir mixture into the soup, stirring constantly, until thickened. Serves about 6 - 8.